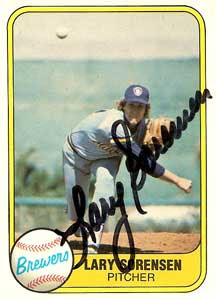 Apparently former Brewers pitcher and current (until yesterday) Detroit Tigers announcer Lary Sorensen learned a little more than how to pitch a baseball during his time in Milwaukee. He has been arrested for his 7th DUI. According to the report, Sorensen's blood alcohol level was six (that's right - 6 - S-I-X) times the legal limit of 0.08 in Michigan. Holy crap! That's 0.48! He's lucky he's not dead. He was taken to the hospital for treatment of alcohol poisoning. Hopefully he gets the help he obviously needs. If you're as old as me, you might vaguely remember that Sorensen was one of 11 players suspended by Commissioner Peter Ueberroth in 1986 for cocaine abuse. Obviously his troubles in life started early. Hat tip to Chuckie Hacks for the story.